More than ever, coders need to work with accurate discharge summaries to better serve hospital finances and patients’ well-being. Consider the following scenario: A patient presents with pneumonia on admission. Over the course of the hospital stay, the patient is treated for the diagnosis, which later resolves itself. Following discharge, the attending physician dictates the discharge summary, noting the patient’s condition as bronchitis without mentioning pneumonia. 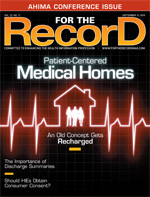 It’s a common occurrence, according to Joann Agin, RHIT, regional manager of data quality with Missouri-based Carondelet Health, who points out that discharge summaries should accurately reflect all confirmed diagnoses and all care administered during a patient’s hospital stay without introducing any new information. In the case mentioned above, the physician neglected to reference pneumonia in the discharge summary, causing the coder to inaccurately code for bronchitis even though documentation throughout the chart reflected treatment for pneumonia. An outside reviewer eventually uncovered the error, and while in this case the bottom line worked in the hospital’s favor, industry professionals warn that more often than not, such mistakes can have a negative impact on compliance and revenue capture. Numerous governing bodies offer guidelines and requirements for completing a discharge summary, but professionals point out there is little standardization to the process. • the attending physician’s signature. • a list of relevant contact information (eg, principal care providers, Visiting Nurses Association, pharmacy, hospitalist). The devil’s often in the details, Richkus points out, adding that while discharge summaries should not be too long, there should be enough detail to fully justify diagnoses. “Physicians often indicate uncertainty in diagnosis,” she says. “Adequacy of Hospital Discharge Summaries in Documenting Tests With Pending Results and Outpatient Follow-Up Providers,” a 2009 study published in the Journal of General Internal Medicine, revealed that key information needed for continuing patient care is frequently omitted. While analyzing data for 668 patients, it was discovered that discharge summaries mentioned only 16% of tests with pending results (482 of 2,927). Even though all the study’s patients had tests with pending results, only 25% of discharge summaries mentioned any pending tests, with 13% documenting all pending tests. Lack of detail, a diagnosis with no support, lack of certainty in communicating a diagnosis—all of these areas represent the current state of affairs with discharge summaries in many hospitals, according to industry professionals. “Doctors will often give all the symptoms but not clearly communicate a diagnosis,” Agin says, adding that while coders have previously been allowed to code “probables” and “possibles,” today’s healthcare climate demands a clearly stated diagnosis. “There’s more emphasis to have discharge summaries list all confirmed diagnoses,” she says. Sears notes that it often comes down to a lack of detail about the severity of the case. “They don’t specify a part of the diagnosis. You don’t want to overcode or undercode,” she says. Identifying congestive heart failure as a common culprit, Sears says there are numerous coding options available based on severity. Coders require a confirmed diagnosis and clear communication of severity in the discharge summary to accurately code the condition. According to Richkus, the most frequent diagnosis-related group errors that occur in relation to discharge summary documentation are associated with renal failure, stroke, sepsis, and pneumonia. Offering a typical example, she points to a patient who presents on admission with aspiration pneumonia. If the physician dictates the diagnosis as simply pneumonia in the discharge summary, an incorrect code may be applied to the chart. “That’s two different reimbursements,” she explains. Other documentation mishaps that create potential coding problems include physicians using arrows (up and down) to reference “hypo” or “hyper” and opting for trendy communication (such as what might be found in text messages) that isn’t necessarily mainstream. Timeliness in documentation has long been a concern for accurately recording discharge summaries, which physicians are required to complete within 30 days of discharge. “It’s not unusual to see discharge summaries completed two weeks later,” Agin says. The expanded use of hospitalist groups to treat patients during hospital stays has heightened the need for more timely and accurate discharge summaries, according to Sears. The concept of the hospitalist—or hospital-based physician—appeared about a decade ago, but it is rapidly becoming more widely used, according to industry professionals. With the advent of declining salaries and managed care, physicians began to cut back on their hours and on-call responsibilities. Many healthcare organizations now use hospitalists to care for patients during emergency department visits and hospital stays. Key information is then communicated to the primary care physician after a patient is discharged, making timeliness and accuracy of discharge summaries important to follow-up care. “If your primary care doctor does not come to a particular hospital … without a proper discharge summary for follow-up, they are going to be treating you blindly,” Sears says. When Richkus has worked with hospitalist groups, obtaining timely discharge summaries has proven to be an uphill battle. In a recent case in which a large hospital system was trying to get its documentation up to speed, she found that 50% of the records needing attention came from hospitalists. “The use of hospitalists is a huge issue in this area,” she says. Along the same lines as using hospitalists, Agin says multiphysician groups following patients in the hospital can create challenges when one physician fills in for another. “Sometimes if a doctor who hasn’t been following the patient does the discharge summary—especially if the patient was seen on only one day—the summary will not likely give a clear picture,” she explains. As the final loose end tying up a complete patient record, the discharge summary has the potential to affect many areas of the hospital, including continuity of care, compliance, revenue cycle management, and overall hospital report cards. “Once it’s coded, this information translates into mortality and severity ratings,” Sears says. The consequences for not completing the necessary components of a discharge summary can be far-reaching. Richkus points to physicians who have held up as much as $400,000 to $1 million in potential revenue by not completing discharge summaries in a timely manner. In such a case, a hospital may not have much recourse. “If a physician’s your top admitter, what are you going to do?” Richkus says. Because they lack important detail for determining severity and present-on-admission indicators, Sears says coders should avoid coding directly from discharge summaries. “Here [Caritas Christi Good Samaritan Medical Center] we code throughout the chart,” she says, adding that the additional backup documentation can present a clearer picture and better case for compliance. Some industry professionals believe the information captured in the discharge summary will become more complete in an electronic environment.